Raised on silver and bronze age comics! A collaboration comic done on Comicfury, by authors on Comicfury, for the Comicfury community! Everyone is allowed to contribute to the story! Visit this thread to find out how to contribute a page, and to sign up for a page! For more information, PM Parkblog79. Fantomah, Mystery Woman of the Jungle first appeared in Jungle Comics #2, Feb, 1940. The first superheroine, predating Wonder Woman by about a year. Since Fantomah never had an origin story, I decided to give her one, so here it is! Comic written in 1995 for a Star Trek fanclub newsletter. Unfortunately the newsletter was dropped before they could be printed. 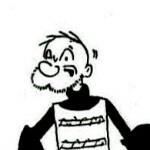 A satire of both Popeye and Klingons. A three part and one art story. Random pages. Some strips some single pages.